I would LOVE to try these, alas I never have bacon grease. Gah, first not liking sweet tea and now this? They are going to take my Southern credentials away! You don’t like sweet tea?! With bourbon? Now that could be a game changer! 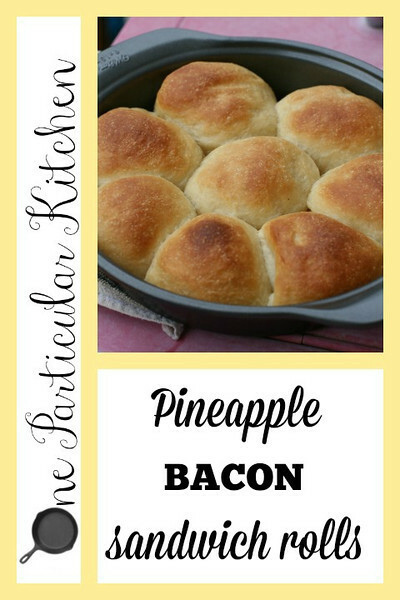 Whoa, how did I not know you can make rolls with pineapple juice and bacon grease? This sounds absolutely fantastic! What a great idea! When I first read the description, I wasn’t interested (yeah, I’m that weird girl that doesn’t like pineapple with my meats – at all – no Hawaiian Pizza, no Tacos al Pastor, no to most Polynesian dishes), but after seeing the picture and reading the recipe, this looks pretty fabulous! We have a BaconFest every summer at our house and these would be the perfect base for a pig-centric sammie! Thanks for the inspiration! BACONFEST? Um, THAT sounds pretty fabulous!